When it comes to ranking highly in search engines, content is king. After all, search engines jobs are to provide the best possible content to users based on their search term. Search engines are always on the lookout for valuable content that users love. Every article you have on your website should be at least 400 to 500 words. Ideally, your articles should be between 800 to 1500 words. Search engines view longer content as in-depth resources. Thus, providing a good amount of content will help increase your rankings. It’s important that you don’t go overboard though. Search engines frown on content that is too long. Articles that are 2000+ words are considered too long and are penalized. Every article should include 1 to 4 links to authority websites. These links should point to articles that help your readers further understand the topic you are covering. Just adding a few quality links can make a fairly significant difference in your search engine rankings. Search engines love “authority sources of information.” By linking out to great websites, your article looks more like an authority source of information. Great images make your articles more interesting. It’s not surprising that search engines give a boost to articles with a few pictures. To increase your ranking further, include one of the keywords you are targeting in the “ALT” text of the image. Videos can really improve the quality of your articles. Add videos that you’ve created that relate to the subject or embed videos from websites such as Youtube. As long as your video relates to your article and provides value to your readers, the search engines will rank your articles higher. 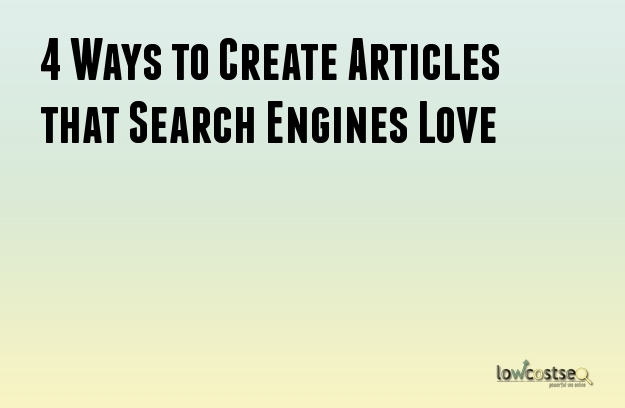 Using all of these techniques will help you create articles that readers and search engines both love. This is the ideal combination for building a valuable website that receives a good amount of traffic from the search engines. Of course, the search engines are far from perfect. Many good pieces of content don’t rank as highly as they should. Luckily, our team of SEO specialists at Low Cost SEO are here to help. We will ensure that your website ranks higher in the search engines for a low cost.